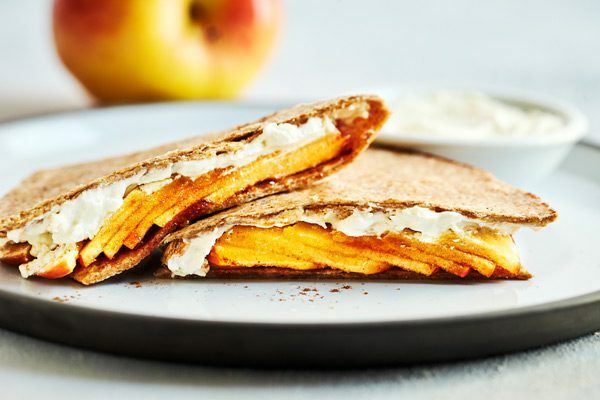 Apples, cinnamon, and cream cheese are a delicious combination in this Apple Cinnamon Quesadilla recipe. 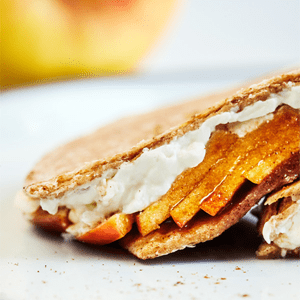 Its whole-wheat wrap crisps up perfectly in a skillet and keeps this snack in the “healthy carbs” column. 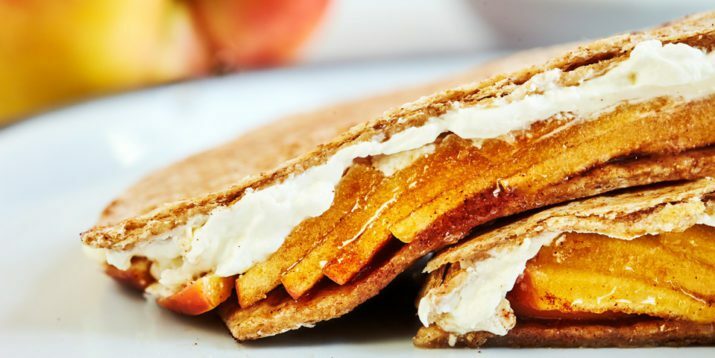 A drizzle of honey (or maple syrup if you prefer) takes this fruity quesadilla from healthy snack to tempting treat. The original recipe is so good, you might want to make it the same way every time, but there are plenty of ways to modify. Instead of apples, you could try sliced pears or peaches, or use an all-fruit spread like sugar-free apple butter. Swap the cinnamon for ground ginger or nutmeg. For a slightly lower-calorie treat, choose Neufchâtel cheese instead of cream cheese (available in most grocery stores right next to the cream cheese). 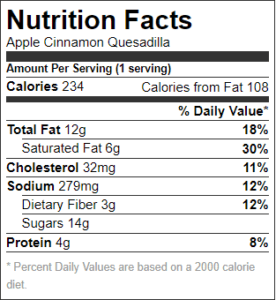 Not only is this quesadilla a hit with the kids, it makes for a quick breakfast, healthier dessert, or a great midday snack that you can feel good about. And, it’s a great little pick-me-up that can tide you over until dinner. A quick note of caution: the filling can get quite hot, so do allow some time for it to cool before eating, especially if you are serving it to children. Spread half of tortilla with cream cheese. 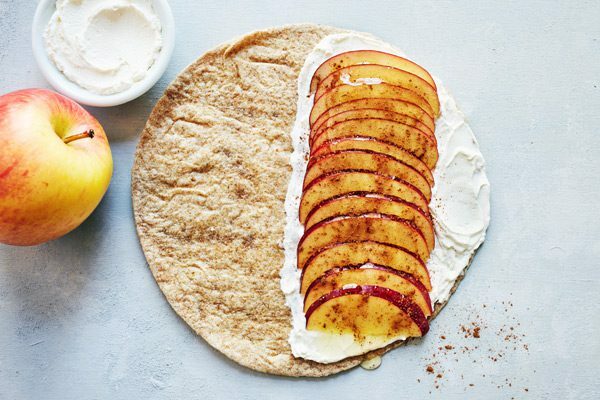 Top cream cheese with cinnamon, honey, and apple. Fold tortilla in half; cook in medium nonstick skillet over medium-high heat, for 4 to 5 minutes, turning once, until apple has softened and tortilla is golden brown.